Technically, tonight is supposed to be my night off, but I wanted to quickly share my interpretation of the RUT chart. It's not a guarantee, but due to the depth of the recent retracement, and the structure of the prior rally leg, RUT looks like it will probably return to test the 765 area again. Under this interpretation, the current rally is either complete/almost complete (blue "(c)? ", red "2? 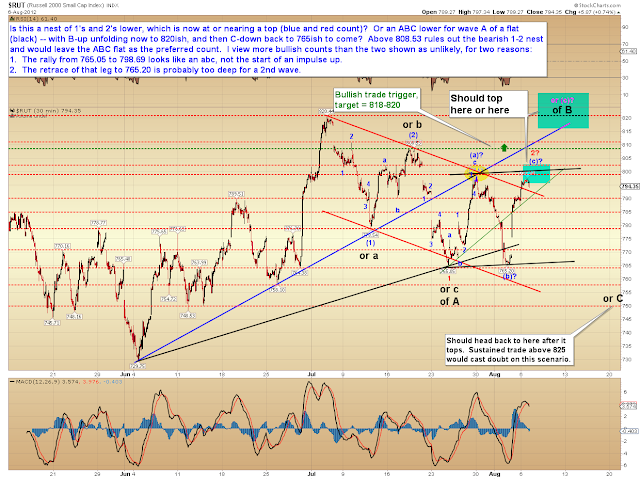 "), or will head back to retest the 820 area first (black "B"). Trade above 808.53 rules out the very bearish blue and red count, but there is no hard stop for the black ABC count, though sustained trade above 825 would cast doubt on the black count. It's important to be aware that the bullish interpretation of this chart (not shown) is extremely bullish -- so if you decide to try and trade this on the short side going forward, stay very nimble. My "not trading advice" would be: if you get a good low-risk entry (and decide to take it) -- if it doesn't perform from there, then don't push your position.